The Por Larranaga Montecarlos is a hand-rolled, mild-medium bodied Slim Panetela, 6.3” (159mm) long, of 33 ring gauge, and comes in a 25 cigars box. This is the ideal cigar for an afternoon stroll. It has intense woody flavors, and profuse smoke. A 2002 release. 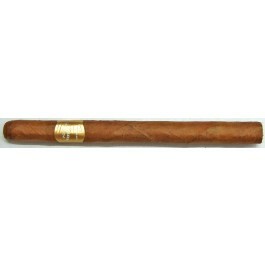 The Por Larranaga Montecarlos is a sweet and mild and has the characteristic Por Larranaga caramel taste. • Por Larranaga Montecarlo offers beautiful construction and an interesting flavor profile. • This mild smoke, accessible to beginners, wouldn't disappoint a veteran either. This cigar is great in the morning or as an accompaniment to afternoon coffee. With its small ring gauge and length, the Por Larranaga Montecarlos appears slim with a dark brown smooth wrapper. Some plume is present. Aromas of leather and spice. A nice, even burn and an easy draw. The ash holds nicely. The cigar starts out with a really pure roasted tobacco flavor. It really showcases the Cuban "twang". You get honey, vanilla, cedar, and tobacco in the beginning, with just a hint of something floral. Continuing into the middle third, plum and spice emerge (nutmeg or cinnamon, maybe both), with a bit of cool mint. There’s also something of whiskey in here. Before the end of the second third it settles down into some creamy coffee flavors. There is also some taste of bread. It is a lot like a croissant dipped in coffee with cream. The end hinted at getting some nutmeg or cardamom, but mostly just kept developing the creamy coffee flavors with a hint of wood. In summary, flavors are mild and not overpowering. Never harsh, the texture of the smoke is velvety and chewy.